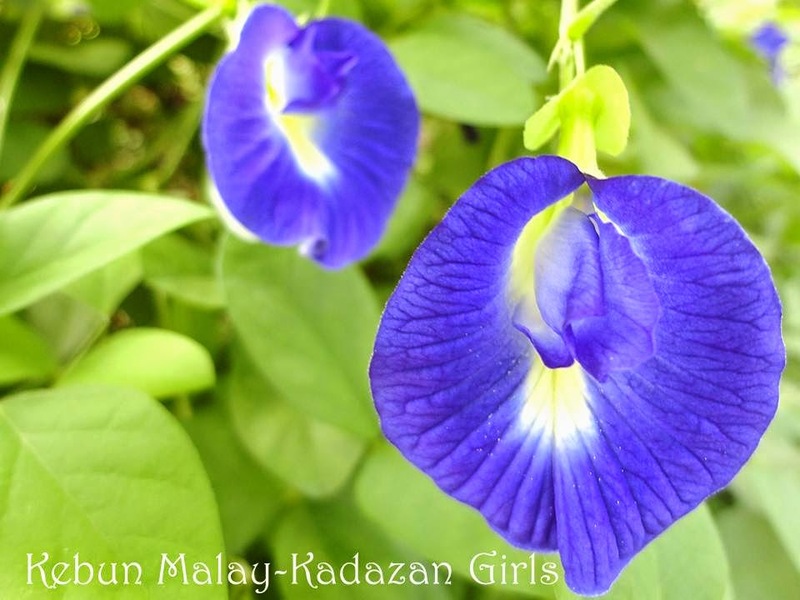 The butterfly pea or Clitorea ternatea is named by some taxonomist as having the shape of 'ahem' women private part. 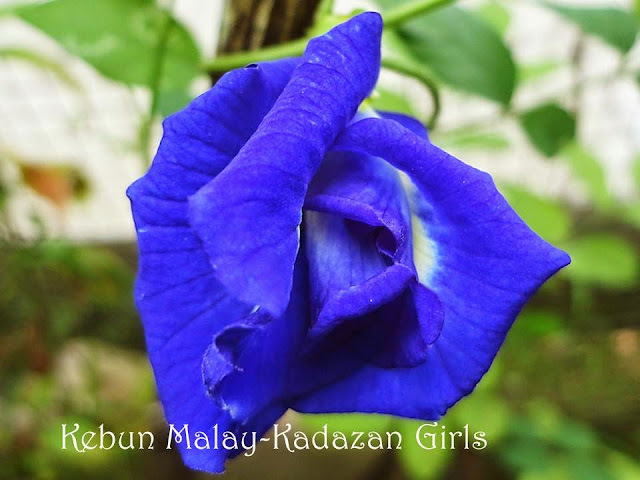 The butterfly pea flower is a plant easily grown in the tropical region all year round. This is a wonderful plant not only providing us continuous beautiful blue bloom but also helps nourishes the soil. A plant that thrives in any type of soil and will bloom more profusely in poor soil. A low maintenance plant that does not require the gardeners to feed the plant but generously makes the soil become more fertile and also provide food. In abandoned mining area in Australia to make the soil healthy again, butterfly pea plants are planted for re-vegetation. Buttterfly pea seedlings. I think it will also grow in temperate region if there are four months in the year of hot/warm season. I would imagined if I live in Adelaide, I can sow some seeds in August-September (spring) indoors and planted the seedling out by October (late spring), I would have some flowers to harvest in summer till autumn. But don't worry if you fail first time before the flower bloom. 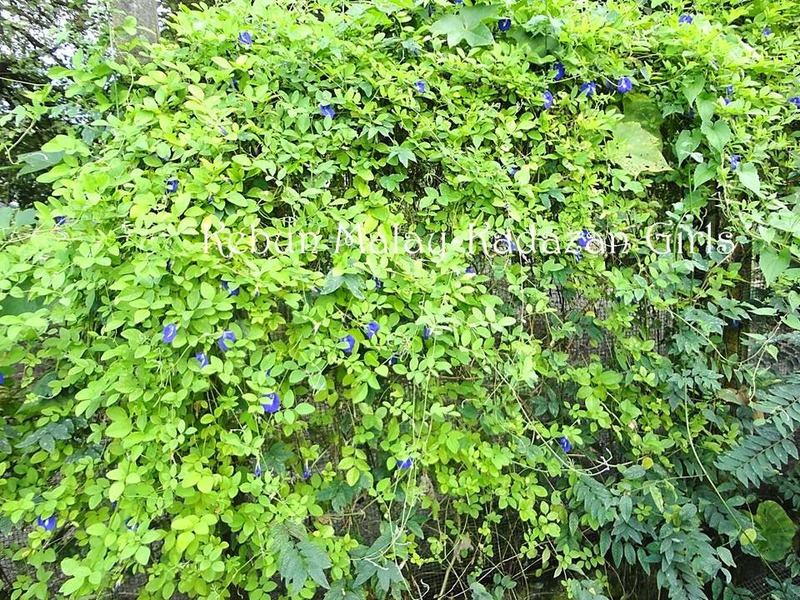 You can make high quality pea straw/hay from the butterfly pea plants. To make high quality pea straw from the butterfly pea plants, cut down the plant before they start to flower or produce seed pods and dry them. You can have your own home-grown mulch to protect your plants during the dry season from becoming thirsty easily or warm the soil during cold season. Butterfly pea grows very fast, it can starts to produce flowers in 10 weeks if weather is preferable to them. Said to withstand minimum of 15 degree Celsius and grows robustly in weather above 25 degree Celsius. 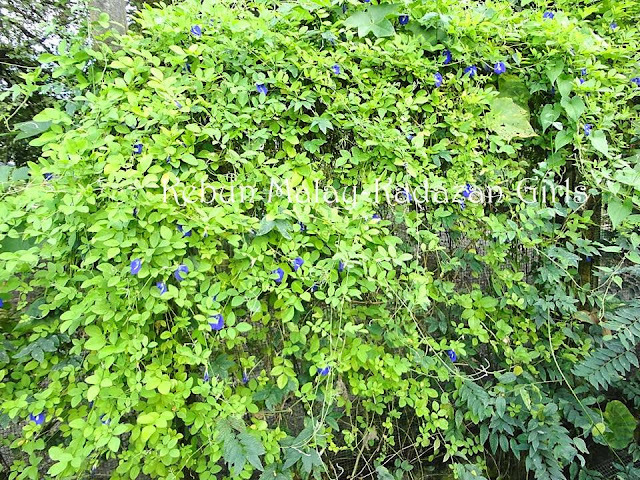 The butterfly pea plants is a vigorous climber. Plants can climb at least more than 2 metres high and can help you cover up old rustic fence. Butterfly pea plants self-seeded readily. It has now become a weed in our kebun (garden). Can be use for livestock food. You can pick the butterfly pea bloom and eat them raw or as a salad. Will definitely make a nice colour mix in salad. 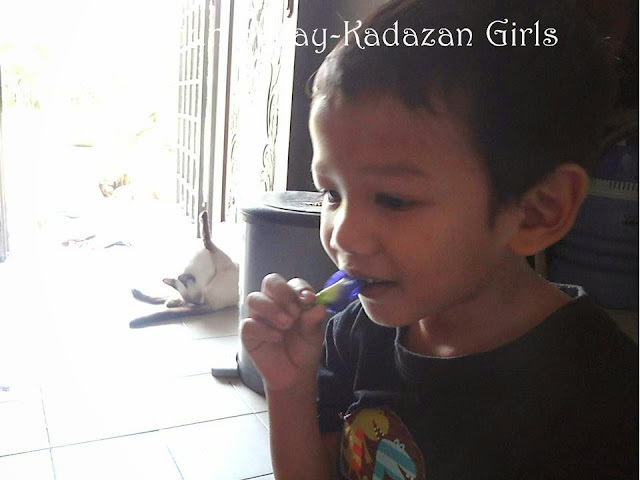 Rayyan likes to eat the bloom raw. Sometime I also give our 9 months old Abby some butterfly bloom to munch while we harvest them. Abby has a blue lipstick on her lips. Butterfly pea flowers and seed pods. You can dry butterfly pea flowers and save them for tea. Will be nice to have some dried butterfly pea flowers in the pantry for warm tea in raining or cold season with cakes for tea times. Butterfly pea is said to be good for the eyes. In this corner, they are actually 2 sets of bamboo stick tepee. But the tepee has become the leaning Tower of Pisa week by week. 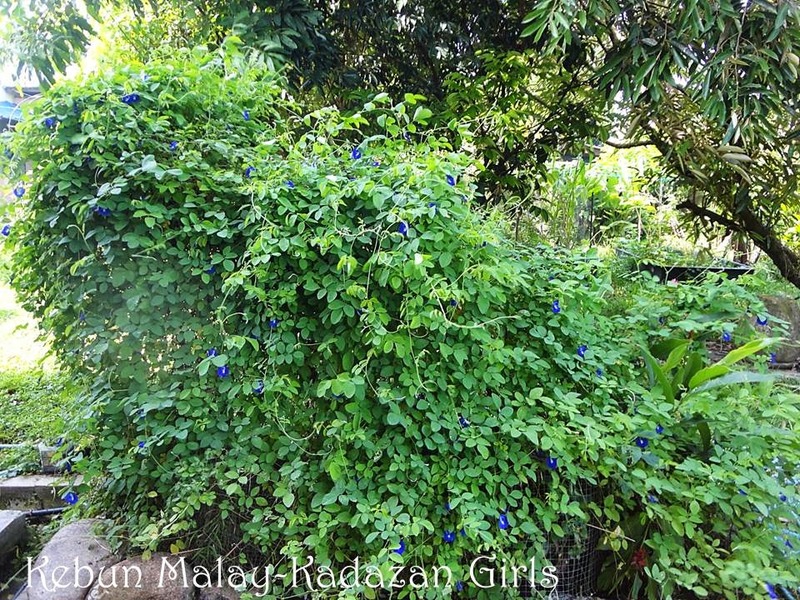 This is the corner which we usually harvest the flower since it is closer to the house compare to other butterfly pea plants at the backyard. 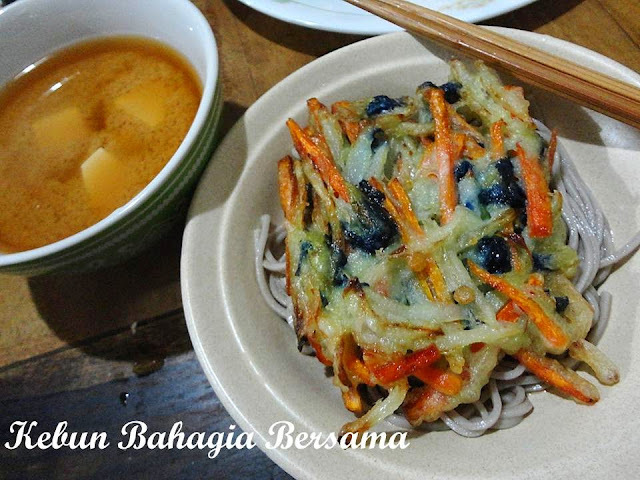 You can make fritters with butterfly pea flower or Japanese kakiage. Or magic smurf drink which slowly turns to pink if added lime/lemon (citrus) juice into the drink. 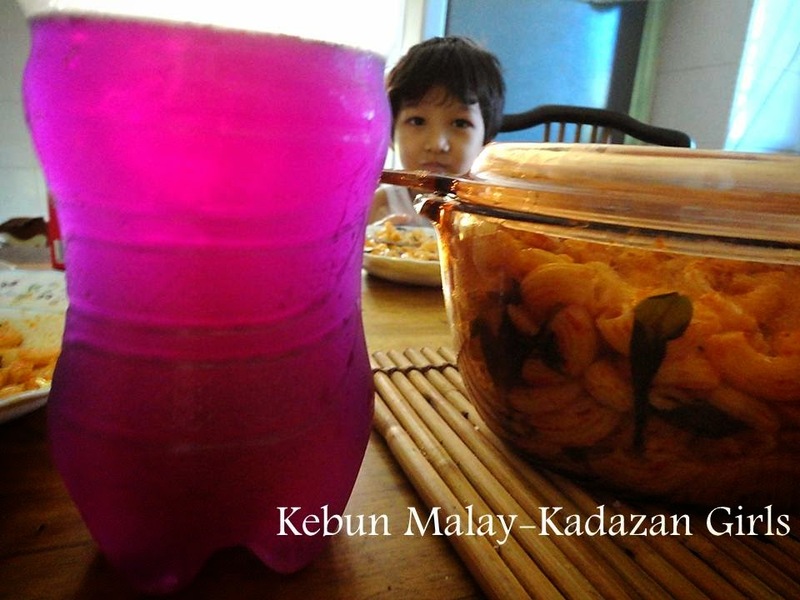 Almost everyday, Ilhan after he returns from Kindergarten will help harvest the butterfly pea blooms and also helps to take out the sepals from the flower before boiling the flower with water for their own smurf drink. The picture above is our usual morning scene in the weekends where our children have fun making their own smurf drink still in their PJs. As a parent, I hope this is not only imprinted in pictures but also in their mind when they grew up, this way of life making their own drink is imprinted in their mind and living a healthy life. There is not only a single layer petal of butterfly pea flower. But there is also a double/multiple layer bloom type of butterfly pea flower. I received this double/multiple butterfly pea flower seeds from a generous Sabahan Sister. The multiple layers petal butterfly pea flowers has just started to bloom profusely in our garden and add some more blooms to harvest into our basket. 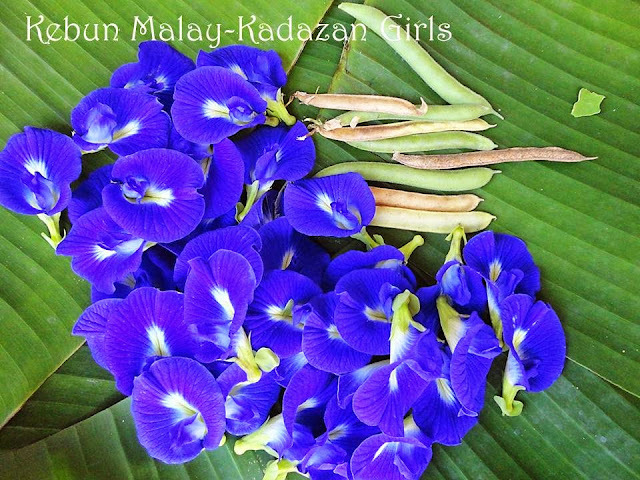 There are actually several colours too of butterfly pea flowers like white and lilac which I have received from a Doctor that has a herbal garden in Langkawi Island. This week we would like to share some single layer blue butterfly pea flower seeds with five gardeners which will randomly pick from the comment box. The boys will write the names on the paper and fold. Then randomly from there the give-away winners will be selected. Will announce the Butterfly pea flower seeds winner in the next post. Saturday Spotlight at Suburban Tomato. Thise flowers are certainly well used by you and your children. 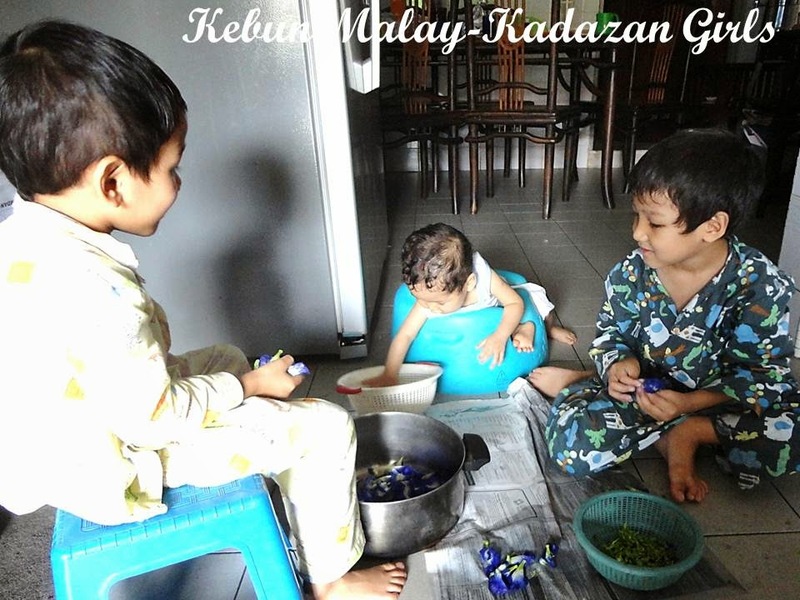 Bunga telang ni boleh buat nasi kerabu jugak kan....lebih sihat tak payah pakai bahan tiruan.....bila baca blog ni baru tau byk gunannya ya....boleh jugak nk join give away ni kalu ada rezeki. Terima kasih. The food that you cooked looks so delicious. This is a natural coloring and is for free. saya x pernah pulak makan bunga seumur hidup saya.. bila saya tgk gambar ke-4 (eating the flower raw) i wonder how it taste..
Wow! These flowers look so amazing both on a plate and on a plant! What a beautiful and helpful plant! Do you think it would grow in Melbourne? I love the idea of your kids preparing their own smurf drinks - fabulous image. Such beautiful flowers. Is it related to pea? It's awesome when a plant flowers and one can eats its flowers and other parts. I've seen this since I was a child but never knew it's uses, I only picked the flowers and sucked the sweet nectar from the back. What a wonderful way to have the children engage in and in an activity together. It is wonderful to see & hear young children participating & learning about gardening. It is wonderful to see & hear young children taking a liking to gardening. Lovely~! Simple Living~ Thank you for taking the time reading our ramblings ;). Hope you will received the seeds soon and have many blue 'butterfly' in your garden during the warmer season. Sue~ The plants grow easily here and if we don't pick them often will be a waste to let the plant go old. Gina~ Yang ni mudah tak perlu penjagaan sangat nak kena rajin petik bunganya je. Salam Narshifa~ Thank you dear. Hope yours will profusely bloom soon too. Nanti Shifa kongsi-kongsilah idea lagi untuk menikmati bunga telang ini. Kak Zie ~ Ya bunga ni untuk warnakan nasi kerabu. Hope you have much fun growing them. Fay Jesselton~ Usually my husband cook Japanese food better than I do. Rainfield61~ Yes more healthier than using food colouring. Helentea~ Oh bunga kantan pun kira makan bunga juga...sama ngan roselle ;) . Rasanya tak strong, very mild itu sebab baby pun boleh kunyah-kunyah je sebab they have more sensitive bud taste. Dewberry~ Yeah. Not just for decoration for filling in the tummy as well. Kancil 8349 ~ Boleh buat ulam. Liz~ I think it will grow in Melbourne, should have sufficient warmer season there cos its fast growing once the weather is above 24 degree C. I will try my best to write the name in detail so it will pass the custom easily. 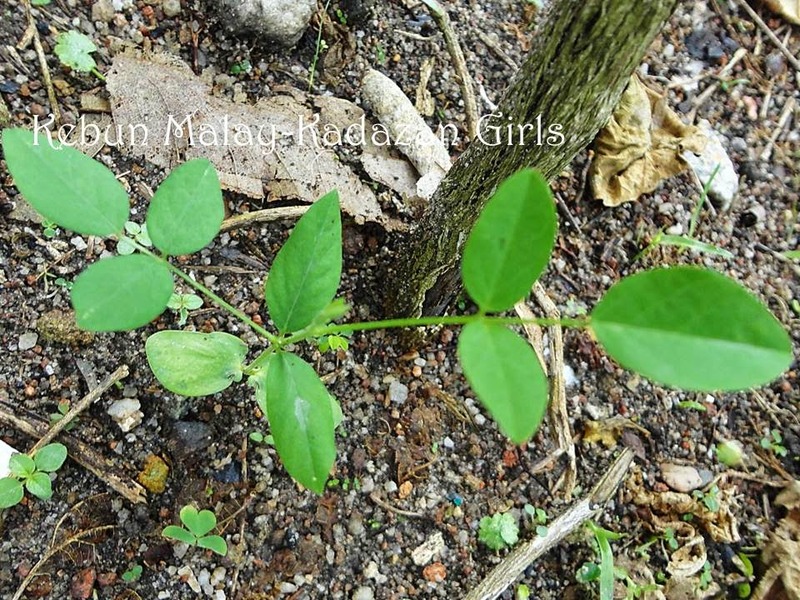 KL~ Yes it is related to pea and the seed pods does look like pea. Albeit smaller. GardenDaDa~ This will be a beautiful creeper. Since it is edible it is a bonus. I hope this will be a very happy memory for them when they are older. Christine ~ Children are more flexible and willing to try new things and concept. Gardening is good for children that has tactile defensive problem as my first had. Early intervention has helped him to overcome this. Assalamualaikum.. May i know where i can get this plant/flowers in sabah? This plant is easily grown from seeds and you can get the seeds at Kebun Bahagia Bersama. Hi i am sarah and am myself a big fan of blue pea after reading about its wonderful healing properties. Would you mind if i get some seeds from you? Also i would like to ask about this give away, what is it about? Hi where can I buy the white seeds? hi where can i get the white seeds in malaysia?